Between family, friends, study and all the other commitments we have, life is busy! It can be really difficult to find flexible roles that allow you to fit everything in. Well, had you considered working in theatre? With venues across the UK, from Torquay to Glasgow, ATG offers enjoyable part time jobs in the evenings and at weekends, with flexible contracts that might just work for you. 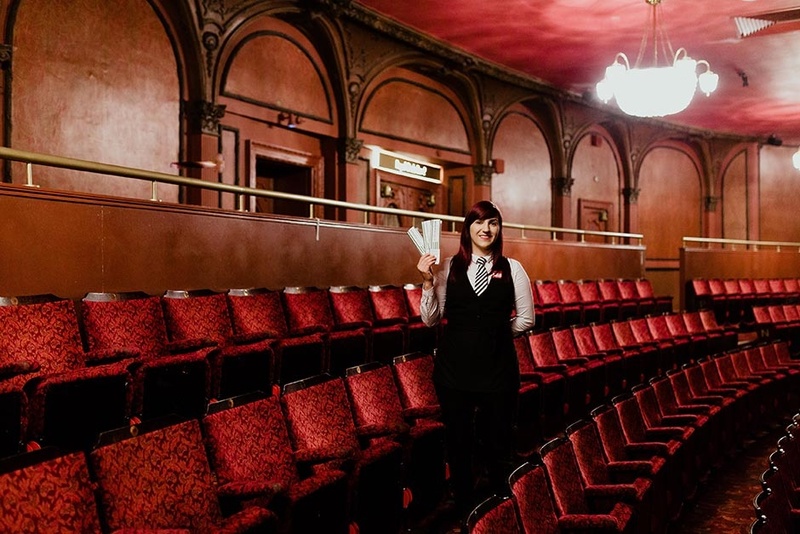 Our Front of House teams welcome thousands of customers to the theatre every evening, up and down the country. We work as a team to cover different tasks and events, so you could be selling programmes and merchandise for a theatre performance one shift, and be offering a first-class bar service for a VIP meeting the next. The reality of our shifts is that they are extremely busy just before the show and during the interval. During those busy times, it's a fast paced job working directly with customers and ensuring they have a great time. While the show is on and things quieten down, we're busy resetting the bar, restocking our sales points, helping customers, cashing up and coming up with new ideas for sales initiatives. We take part in training during this time too. It's an interesting role with lots of variety and new experiences every shift. You can find out more about working Front of House in our feature article here. You may also be interested in roles in our Bistros, our in-house restaurants. Whether you're looking for work that fits around your study, family or other commitments, or if you're looking to try a new direction, working with us is a great part time job. You'll get to meet new people and learn new skills, or apply your existing skills to an interesting new challenge. You gain an insight into our fascinating industry and of course, you might get to see a show or two! We are a friendly team, and our theatres are enjoyable and interesting places to work – working in theatre isn’t your everyday job! There's some practical benefits too. Our theatres are open evenings and weekends all year round; some of our venues are open during the day too, but evenings and weekends are our busiest times. These hours can be really helpful if you have other commitments during the day, and with our flexible contracts you can choose the best days of the week to suit you. Our shifts work on a minimum call basis, so you'll always know you'll be earning at least three hours pay each shift. We don't overbook shifts or send extra staff home at the last minute either, which is common in events work. We also have temporary seasonal roles available for our busiest times, particularly over pantomime season and to cover local festivals (Edinburgh is very busy in the summer!) Many of our teams include people who only want to work at these busy times of year. This job is very busy when you’re at work, but there’s nothing to take home with you afterwards – so if you’re looking after family, studying or doing other things you don’t need to worry about work spilling over into the rest of your day. Many of our Front of House staff started out working with us while studying, and we have a venue in many large university towns and cities. It’s also possible to work in a theatre near your university during term time, and transfer to another nearer home during the holidays. I chanced upon the FOH Assistant role at the New Alexandra in Birmingham nearly four years ago. I'd been made redundant after a long career in museums and wanted work that didn't involve a 9-5 routine any more. I soon fell in love with theatre work! During my four years here I've had the opportunity to experience most of the front of house roles. The area in which I have been encouraged and supported to develop is in caring for the Alex's historical archives, which has in turn led to developing guided tours for both staff and public events. Now that the archive has been sorted and catalogued we are able to use it to tell the history of the venue. I usually work around 6-7 shifts a week across 4-5 days, I do have other casual jobs that fit in during the day (box office at a concert hall venue) but I see the Alex as my main role. Although the job includes weekend and evening working I enjoy having the daytime to myself. Julia, New Alexandra Theatre, Birmingham. Read Julia’s full story. Great! If you’d like to join the team, take a look at our careers site to see our current vacancies and apply online. If your local venue doesn’t have an advert right now you can still apply speculatively, or subscribe for job alerts to be notified when the venue is recruiting. We’ve focused here on working Front of House in our theatres. If you’re interested in other roles with ATG, you can see our current vacancies in these roles and others on our careers site. Please let us know if you require the application form in an alternative format by contacting [email protected]. What are ATG looking for in FOH staff? We’re looking for proactive and enthusiastic people who care about making every theatre visit a remarkable one. You’ll enjoy variety in your work, enjoy working with people and be comfortable blending sales and service. You can see the full details in our person specification. We’ve also got some tips for writing a great application form . Times do vary depending on the event and location. Most shifts start between 45 minutes and two hours before the show starts, so usually between 5.30pm and 7pm for an evening show or 12.30pm and 2pm for an afternoon show. Afternoon, or ‘matinee’ performances, are usually twice a week on Wednesday, Thursday, Saturday or Sunday depending on the theatre. Shifts usually last 3.5 – 4.5 hours and in an evening, finish between 9.30 and 11pm. We’re usually able to accommodate travel requirements, like leaving to catch a last train home, so do ask if you’re considering applying. This does change sometimes depending on the individual theatre and we often have shows come in that are a little bit different. For example, we often have more matinee shows during school holidays and for pantomime and there might be periods during the year where we are ‘dark’, which means we don’t have a show on. Both in London and outside our theatres can be hired for other events too, outside of our normal show schedule. This might include weddings, conferences, filming and community events. Will I be the only one working part time or flexibly? No. The majority of our Front of House teams are people working a part time or flexible pattern around their other commitments. Whether it is for studying, family, another job or the hours just suit you, you definitely won’t be the only one! Please take a look at our recruitment FAQs and the Customer Experience section of our careers website.